Countries that vowed to slash their greenhouse-gas emissions under the Paris Agreement are now supposed to be looking for ways to slash them even deeper, and the Dutch government says it will “Bring Paris Home” by actively supporting home-grown voluntary carbon projects. It’s a program with precedent – and promise. 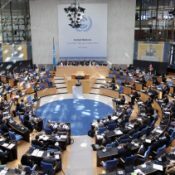 18 May 2017 | BONN | Mid-year climate talks are wrapping up here in the former German capitol of Bonn, with a focus on “accelerating climate action” – the motto that looms large as countries establish rules for “ratcheting up” their pledges to reduce greenhouse-gas emissions under the Paris Climate Agreement. The Dutch government, for example, launched something called the “GreenDeal”, which encourages cities, companies, and individuals to shrink their own carbon footprints by supporting voluntary carbon projects within the country. The initiative came as the Bonn talks were getting underway and could draw more attention at next week’s Innovate4Climate Summit in Barcelona, which focuses more explicitly on the role of business, finance, and technology in meeting the climate challenge. EcosystemMarketplace will launch its 2017 “State of Voluntary Carbon Markets” (SOVCM) at Innovate4Climate. The report takes six months to assemble and is built on surveys of all known market participants. Environment Minister Sharon Dijksma says the GreenDeal is designed to help ease the country into an era when all sectors are capped, much as California used voluntary markets to ease the state into its current cap-and-trade regime. Unlike California, however, it will not involve offsets generated outside of the Netherlands, making it more akin to Japan’s J-VER program (which has since been merged into J-Credit). Past SOVCM reports have shown that some people are willing to pay higher prices for home-grown offsets, although that’s hardly a universal observation. Still, last year’s report identified the rise of local-focused initiatives as a trend to watch, singling out one run by the city of Bologna, Italy and a voluntary carbon land certification in France called “VOCAL”. Dutch attorney Jos Cozijnsen says people will buy local GreenDeal if they understand the product. The program has the backing of environmentalists, energy companies, and investment funds – and it also has plenty of precedent, which Ecosystem Marketplace first identified in a 2012 report called “Bringing it Home: Taking Stock of Government Engagement With the Voluntary Carbon Market”. The 2012 report identified more than a dozen governmental efforts built on voluntary carbon markets – including the Dutch government’s Bosklimaatfonds program, which like GreenDeal aimed to reduce the country’s greenhouse-gas emissions by encouraging cities, companies, and private citizens to buy carbon offsets. The earlier effort utilized the CarbonFix protocol for restoring woodlands, but Cozijnsen says there was confusion over how to account for offsets generated in a country that already belonged to the Kyoto Protocol. Under GreenDeal, he says, the government will develop accounting rules using guidance from the Paris Agreement to ensure that offsets aren’t counted twice. As currently envisioned, the new program will also recognize several different carbon standards, including CarbonFix, and several project types including forestry – but will add its own filters, beginning with location. Before going live, administrators of the program will define measurement methods, verification rules, the trading platform and the registry.